River Valley senior Chelsea Copley throws to first base during the Lady Raiders loss to Gallia Academy on April 22, in Centenary. Copley was named to the D-3 southeast district first team for her efforts on the diamond this spring. 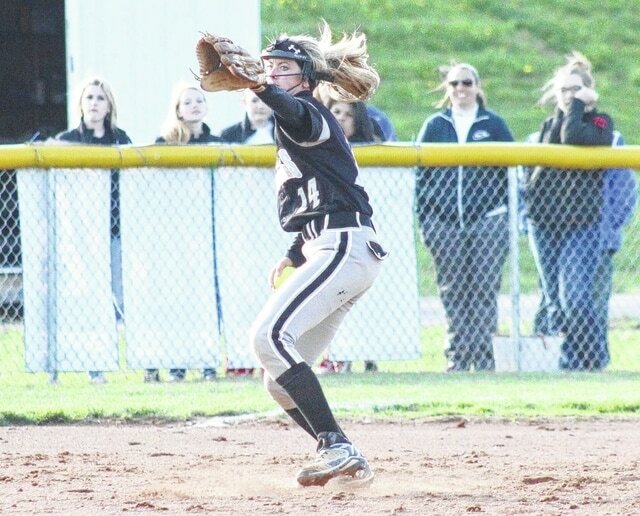 The Meigs and River Valley softball teams combined for eight spots on the 2015 All-Southeast Ohio District softball teams in Division III, as voted on by coaches in the southeast portion of the Buckeye State. MHS sophomore Devyn Oliver earned a spot on the first team on the Division III squad, while sophomore Alliyah Pullins was selected for the second team. Seniors Brook Andrus and Destinee Blackwell were both D-3 honorable mentions for the Lady Marauders. River Valley senior Chelsey Copley was a first team selection, while seniors Katie Mares, Alexis Hurt and junior Ashley Gilmore were D-3 honorable mentions for the Lady Raiders. Copley was also a first team choice for the All-Ohio team. Michael Cunningham of Wheelersburg was named the D-3 southeast district player of the year, while Teresa Ruby of Wheelersburg was selected as the D-3 coach of the year in the southeast district. Michael Cunningham, Wheelersburg; Regan Stonerock, Westfall; Chelsey Copley, River Valley; Kendall Meeks, Alexander; Alayna Lytle, Huntington Ross; Jill Hairston, Rock Hill; Mikayla Purdy, Eastern Brown; Kalle Coleman, Wheelersburg; Ashley Webb, Valley; Mary Pica, Minford; Devyn Oliver, Meigs; Adrien Dunn, Piketon; McKenzie Whitaker, West; Katie Osburn, Belpre; Brittany Johnston, Wellston; Peighton Williams, Portsmouth; Aley Carmon, Ironton; D’lani Swackhammer, Zane Trace; Hannah Howery, Alexander; Ellen Hinshaw, Fairland. Haley Rawlins, South Point; Faith Howard, Wheelersburg; Alisa Kelley, Nelsonville; Leah Crum, Dawson Bryant; Cassidy Williams, Westfall; Ashley Riley, Northwest; Morgan Geno, Zane Trace; Abbey Winkler, South Eastern; Megan Shupert, West; Kasei Russell, Rock Hill; Taylor Dempsey, Wheelersburg; Natalee Jones, Adena; Mackenzie Riley, Fairland; Alliah Pullins, Meigs; Ariel Kingrey, Minford; Breanna Klaiber, Ironton; Morgan Crabtree, Oak Hill. Ashley Gilmore, River Valley; Alexis Hurt, River Valley; Katie Mares, River Valley; Sarah Garza, Nelsonville York; Shoshawna Phillips, Nelsonville York; Madison Harman, Belpre; Andi Queen, Portsmouth; Ariel Whitt, Ironton; Kylee Metzger, Ironton; Denise Arledge, Westfall; Kelly Fuchs, Westfall; Morgan Fridley, Fairland; Mollie Morris, Fairland; Melanie Noble, Chesapeake; Kelsey Huff, Chesapeake; Laura Rice, Chesapeake; Brooke Webb, Chesapeake; Brook Andrus, Meigs; Destinee Blackwell, Meigs; Kacey Felts, Adena; Brooklyn Detty, Adena; Carly Carroll, Adena; Brittany Allen, Lynchburg; Madysyn Creighton, Lynchburg; Chelsi Hacker, Lynchburg; Hannah Binkley, Lynchburg; Kennedy Debord, Huntington Ross; Brookelyn Neighbors, Huntington Ross; Rikki Magill, Huntington Ross; Ali Allen, Minford; Zoey Doll, Minford; Jenna Lane, Rock Hill; Makenzi Harrah, Rock Hill; Morgan Arledge, Zane Trace; Katelyn Stewart, Wellston; Amber Altman, Valley; Kirbi Sommers, Valley.